Nancy Scalf was born March 1788 in North Carolina. Her birth is listed as 1789 in various places. A statement by Polly Scalf Trent in support of her father’s pension in Hawkins County, Tennessee reveals that Nancy was her older sister. This is the only information obtained at this date to confirm which child was the oldest child of John and Edeah Carlisle Scalf. Edeah (aka Edy) Carlisle Scalf listed birth dates of both her oldest daughters at two separate intervals in her deposition for her pension benefits after the death of her husband, John Scalf, Sr.. In one statement Edeah stated Polly was born 1788 and Nancy, 1789. In another statement, she stated Nancy was born in 1788 and Polly in 1789. This was likely due to her age at the time of the statement. As with most census records, the estimated dates of birth for these two daughters range in different years for both of these girls from census to census. Considering the fact that John and Edeah were married 1787, the statement of Edy concerning the months and years of birth, coupled with Polly Scalf Trent’s statement, we can safely assume that Nancy Scalf Collins was born in 1788 in North Carolina, and probably in Edgecombe County. Tracking Nancy Scalf Collins has certainly proven to be a challenge and we are still uncertain as to the husband of Nancy Scalf. Many avenues have been followed concerning the husband of Nancy but for the most part have been dead-ends. An effort to narrow down the possibilities of who the husband of Nancy Scalf Collins might have been is offered here for research purposes for this line of the family. Correspondence with some of the Collins family researchers has failed to produce the name of Nancy’s husband but it seems likely that at least one Nancy Collins has been confused and might possibly be our Nancy Scalf Collins. As most families did during the early years of settlement of this country, the Collins family repetitiously named their children after their parents, grandparents, brothers and sisters. As with the Scalf family, there are numerous folks of the same name in these lines. Separation by birth years, wills, death records, children’s names, deeds and numerous other records is generally the only way one can distinguish one name from another. Research of the Collins family is not intended in these writings; however, information obtained in my research of Nancy Scalf will be offered here as a guideline for researchers. This information may or may not be helpful. As stated above, Nancy Scalf was born in either March or April of 1788, probably in Edgecombe County, North Carolina, as this is where her parents married in 1787 and are believed to have been living at that time. Her mother stated two separate birth dates for Nancy and Polly so we cannot be certain of the month of her birth but from the statement of her sister, Polly Scalf Trent, we can be certain that Nancy was born first and in 1788. The marriage record for John Scalf, Sr. and Edeah Carlisle has not been found at this time; however, his wife, Edy Carlisle Scalf, stated that she married her husband, John Scalf Sr. in the county of Edgecombe in the state of North Carolina on February 15, 1787. Nancy’s parents left Edgecombe County where they are believed to have been living in the home of John’s father, Lewis Scalf, in 1790 and traveled to Surry County, North Carolina by 1800. The family was in Floyd County, Kentucky by 1810, Russell County, Virginia 1820 and 1830 and in Hawkins County, Tennessee by 1840. Her father died March 10, 1848 in Greene County, Tennessee. Although the census records are the only documents that confirm where the John Scalf Sr., family was during this time, another document confirms that John Scalf, Sr. went to Russell County, Virginia before his move to Floyd County, Kentucky in 1810. This information was obtained from the statement of Polly Scalf Trent, sister of Nancy, in her deposition for the re-instatement of her father’s pension in Hawkins County, Tennessee in 1845. Analysis of this statement reveals that John Scalf, Sr. was living in Russell County, Virginia 1806 – 1810. He appears on the 1800 Surry County, North Carolina census, then on the 1810 Floyd County, Kentucky census and then on the 1820 and 1830 Russell County, Virginia census. The years between the census records could place John Scalf, Sr. at any location but we find that Polly was correct in her statement that he was in Wilkes County, North Carolina when he left as the Wilkes County court records show that he was charged, along with James Bogus for the theft of a hog in Wilkes County, North Carolina around 1805. Bogus left the area and John remained for a time but ultimately left. John probably thought he would have to suffer the consequences of this charge alone since Bogus had left. John in turn left the area and his brother, William, accepted the bond for John in the amount of $40 to guarantee his appearance in court. However, John fled the area as well. John’s father Lewis picked up the bond in 1807. A horse, cow and a few other items belonging to John were confiscated in 1805 before John left the area. The case was continued against Lewis until 1813 – 1814. It is unknown at this time as to how this case eventually turned out. It is assumed that John’s father, Lewis, eventually settled the case. 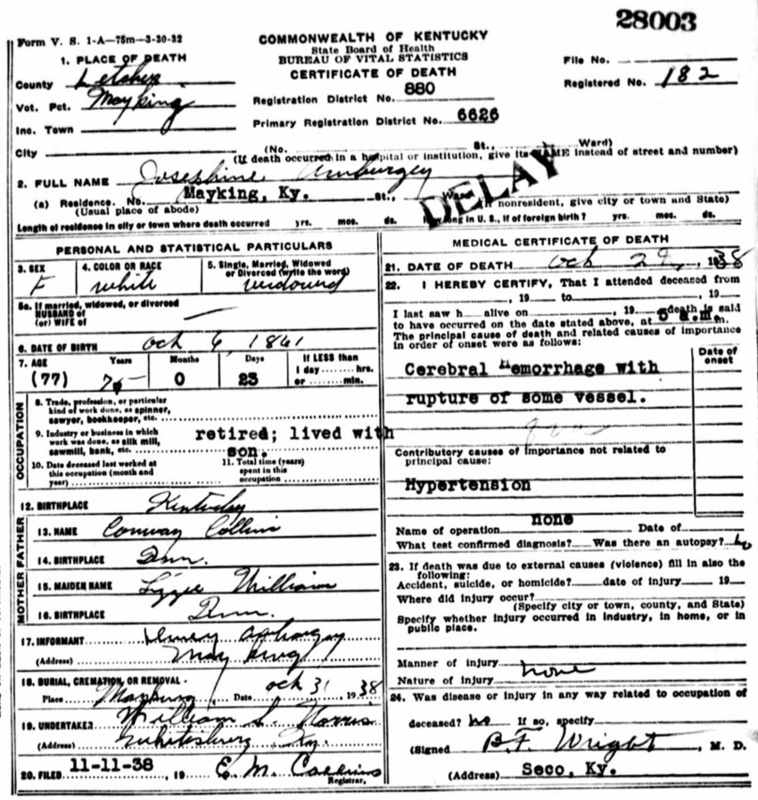 It is unknown by records whether John ever saw his father again or not but it is evident that some type of family connection remained for Patsy Counts Scalf stated that “Lewis was upwards of 100 years old when he died in Georgia many years ago.” This statement was made in 1845. There had to be some type of correspondence between the families for Patsy to have known when Lewis Scalf died. Whether John was guilty of the charge or guilty by association is unknown as no further records were found. John could very well have gone to Russell County, Virginia before Floyd County, Kentucky, as Wilkes County, North Carolina is located in what is known as the New River Valley. This area was a very well traveled route of the early settlers moving down the valley into the Washington County, Virginia area and ultimately into Hawkins County, Tennessee and also into Kentucky via the Cumberland Gap. Russell County had been created in 1786 from Washington. By the time John Scalf, Sr. arrived in Russell County, Virginia several Trent and Collins families were living in the area of Washington and Russell Counties. It is most likely here in one of these locations that Nancy and Polly Scalf met their husbands as well as Dicey Scalf Williams. The Williams, Collins and Trent families traveled down the New River Valley area very early on and some can be traced back to North Carolina by this route. It is also possible the Scalf family met some of these families along this route but it appears the Williams, Collins and Trent families were in Russell and Washington earlier than the Scalf family. In 1806 when John Scalf, Sr. left Wilkes County, North Carolina, Nancy would have been 18 years old and Polly 17. Dicey would have only been six years old. Both Nancy and Polly would have been old enough to marry before 1820. The 1806 Personal Property Tax List of Washington County, Virginia shows that John and Patrick Collins were living in Washington County, Virginia along with John and David Williams. This tax list can be found on the USGenWeb. Transcribed by Jeffrey C. Weaver, September 22, 1998. Several Williams families were living here in 1802 listed in the Upper District – Jesse Browning’s list. These were Shadrick Williams, Henry Williams, Samuel Williams, Richard Williams and James Williams all listed on Jesse Browning’s list. Living in the lower district – Robert Tate’s list – were John Williams and Samuel Williams. Some of these families were living here as far back as 1788 and 1789 and appear in the Montgomery County, Virginia tax records. The Collins families first appear on the tax lists of Washington County in 1806 but were also listed in the Montgomery County tax lists earlier. A brief summary of the county creations might be in order here to better understand where these early settlers were living. Russell County was created in 1786 from Washington County, Virginia. Washington County, Virginia was created in 1776 from Fincastle and Montgomery. Montgomery was created from Botetourt and Fincastle in 1776. Botetourt was created from Augusta in 1769 and Fincastle was created from Botetourt in 1772 and abolished in 1776. Due to these county formations, the tax lists of Washington County, Virginia appear to overlap with the tax lists of Montgomery and Fincastle Counties in some years. The now New River Valley area consists of the counties lying along and connected to the North Carolina/Virginia border which are: Johnson, Ashe, Alleghany, Surry, Watauga, Wilkes and Yadkin Counties in North Carolina and Washington, Grayson, Carroll, Patrick, Smith, Wythe, Floyd, Tazewell, Bland, Pulaski, Montgomery, Tazewell, Giles and Roanoke with most of these counties being formed after these early families traveled through. At the time of the travels of the folks we are interested in, the main counties in the New River Valley area would have been Montgomery and Washington Counties in Virginia and Wilkes and Surry in North Carolina. Some of these folks lived along the Yadkin River in North Carolina. This should not be confused with Yadkin County, which was formed later. Surry Co., NC formed from Rowan. Wilkes was formed in 1777 from Surry and the District of Washington. Yadkin County was formed in 1850 from Surry. Interesting, and very confusing to researchers is the district of Washington. This later became Washington County, Tennessee. Wilkes County was formed from parts of Surry and what was known as the Washington District of North Carolina. Washington District became Washington County, North Carolina before Tennessee became a state. When Tennessee became a state in 1796,Washington County, North Carolina became Washington County, Tennessee. There is also a Washington County, North Carolina but again this is not the same county as Washington District or Washington County North Carolina/Tennessee. This Washington County was formed in 1799 from Tyrrell. These early Collins, Williams and Trent settlers most likely met along the New River Valley area of the North Carolina and Virginia counties and the Scalf family might have been acquainted with them in North Carolina as they seemed to travel some of the same routes. However, Nancy, Polly, Dicey and possibly another sister, Betsy most likely met their husbands after their arrival in Russell or Washington County, Virginia and possibly even in Floyd County, Kentucky. Nancy Scalf Collins’ family, along with Polly Scalf Trent and Dicey Scalf Williams, might have moved over to Kentucky at some point with their father’s family in his movements between Russell County, Virginia and Floyd and Clay County Kentucky but if so, these families returned to Russell County, Virginia and to Hawkins County, Tennessee where they appear to be enumerated in the 1830 and 1840 censuses. The Collins family does not appear in the Russell County, Virginia tax lists until 1799 when Meridith Collins appears taxed with one white poll. There are several Collier families listed but the name remains the same throughout the tax lists and by this we assume that there was a Collier family in the area and this spelling was not a transcribing error. Merady Collins (assumed to be Meredith) appears again in 1801 but is not found in 1800 in the tax lists. Meridith is not found after the 1801 Personal Property tax list but a James Collin appears in the 1810 Personal Property Tax list of Russell County. However, Meredith Collins is found in Floyd County, Kentucky in 1810 at the same time John Scalf, Sr. appears in Floyd County, Kentucky. It appears that Meredith remains in Kentucky but John Scalf, Sr. returned to Russell County, Virginia by 1820 where at least three Collins families appear namely; Martin Collins, Isaac and Sarah Collins. James Collins is not found in Russell County after the 1810 Personal Property Tax list and it is presumed he has moved down to Hawkins County, Tennessee where a James Collins is found on the 1830 census. In 1830 a John, Isaac and Sally Collins are found as head of house in Russell County, Virginia. In 1840, Burgess, Edward, Sarah, and Amy Collins are found as head of house in Russell County, Virginia. Sarah is most likely the Sally listed in 1830. By 1850, a very large number of the Collins family are living in Russell County, Virginia but the Scalf family has moved to Hawkins County, Tennessee by 1840 and a number of the Collins, Trent and Williams family are in the neighborhood. From the above information, Meridith Collins was the only Collins family near John Scalf, Sr. in 1810 in Floyd County, Kentucky and was also in Russell County, Virginia but not found at the same time as John Scalf, Sr. was living there. In tracing the Meredith Collins family, Meredith was age 45 or above in Floyd County, Kentucky. Meredith has two sons in the home ages 10 – 16. Nancy would have been at least five years older so it is doubtful she married either of these sons. It also appears that Nancy and Polly are in the home of their father in 1810 as there are two females listed with births estimated 1784 – 1794. No other Collins family was found in Floyd County, Kentucky in 1810. By the enumeration of the 1820 census, there is a Bradley Collins living next door to Meredith in Floyd County and listed as either mulatto or “free persons of color.” Meredith’s family was also listed the same. This could have been an older son of Meredith but we have no way to determine this from this census. John Scalf, Sr. has returned to Russell County, Virginia by 1820. In 1830 Meredith was found in Pike County, Kentucky. He is now 60 – 70 years old and born 1760 –1770. There is a male in the home age 10 – 15, presumed to be a grandson. 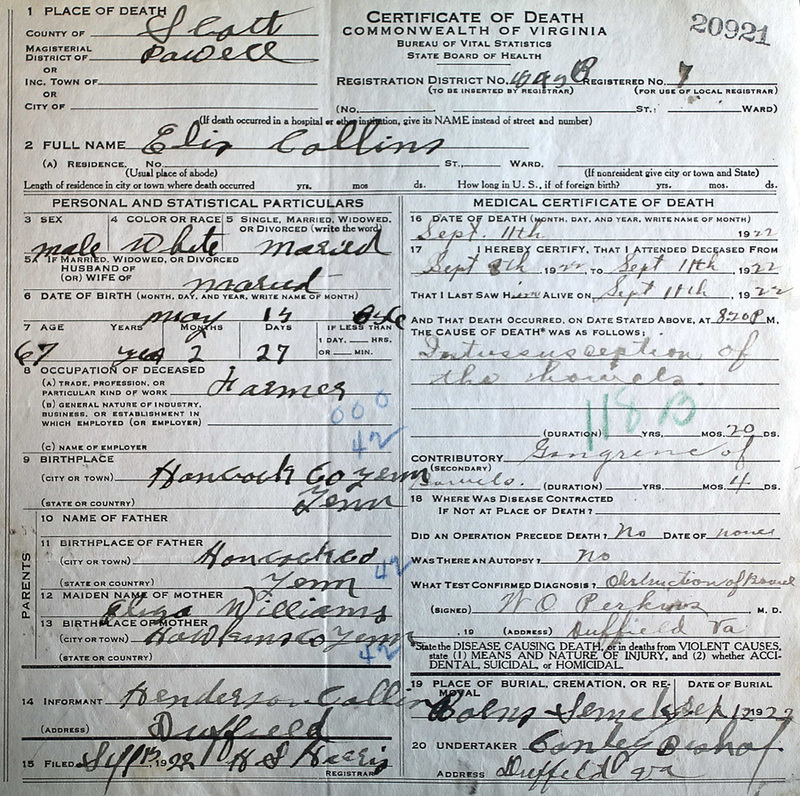 Meredith was not found as head of house after this census and it is assumed he died before 1840. In the 1820 Russell County, Virginia census there are two females who appear to be daughters in the home of John Scalf, Sr. These females would have been born 1794 – 1804. At least one of these females is believed to be Lydia. It is difficult to determine if the other is Dicey, or Betsy but Nancy and Polly appear to be married and in their own homes at this time. 1) Sarah Collins head of house, 26 – 45, born 1775 – 1794. 3) Isaac Collins 45 or over, born 1775 or before. Due to the fact that John Scalf, Sr. made several trips back and forth between Kentucky and Virginia between census enumerations, a study of the Collins family head of house was undertaken in an effort to determine if one of these could have been the husband of Nancy. Martin Collins would be a likely candidate in Russell County due to his age but it is believed by Collins researchers that Martin was not married to Nancy Scalf. The head of house found in Kentucky in 1830 were Abraham, Bradley, Hiram, Amos and Elijah in Clay County, John in Madison County, Amy and Meredith in Pike County. In the household of Hiram is one male under 5 years of age. There appears to be something wrong with this census, as there are no parents in this home. Bradley is listed as 40 – 50 years old and born 1780 – 1790. Although the age fits, his wife is not in the home. Amos Collins is 40 -50 and his wife is 30 – 40. The name of Amos’ wife is established by 1850 so Amos is ruled out as well. Elijah Collins is 30- 40, born 1790 – 1800; however, there is no wife in this home. There is a female listed as 80 – 90 who is probably his mother. All of the above were ruled out as the husband of Nancy Scalf for various reasons. In 1830 a John Collins appears as head of house in Russell County, Virginia. He is listed, as 20-30 years old and due to his age, was likely not the husband of Nancy. Sarah Collins is listed and is believed to be Sally from the 1820 census. Isaac is still living in Russell County but Martin is gone. Martin is believed to be the same Martin Collins that appears in the 1840 Hawkins County, Tennessee census. Isaac Collins is gone from Russell by 1840 and due to his age, is presumed to have died. Burgess, Edward, Amy and Sarah Collins are the head of house in 1840 Russell County, Virginia. Burgess and Edward are also much younger. In the 1830 census of Hawkins County, Tennessee is listed a large number of the Collins family; however, only two males fit the age category to have been the husband of Nancy; Benjamin Collins born 1780 – 1790; Wyatt Collins born 1780 – 1790 and if Nancy married someone older, then Ezekiel and James Collins would qualify as they were born 1770-1780. This James Collins is probably the same James Collins from the 1810 Personal Property tax list of Russell County, Virginia. Nothing is known of this James Collins. By 1840 John Scalf Sr. and some of his children have moved to Hawkins County, Tennessee where they were enumerated on the 1840 census. Other than Edy Collins who appears to be the matriarch of the Collins family, Vardemon (Vardy) Collins appears to be the oldest Collins male in Hawkins County at this time. Vardy is 70-80, born 1760-1770. Edy is 80-90 and born 1740-1750. Vardy Collins is reported to have married Margaret “Peggy” Gibson. In the 1830 Hawkins County, Tennessee census, there appear two men by the name of Benjamin Collins. One is older than the other. Along with these two men is a James Collins. All three of these men are listed as free persons of color as were a large number of the Collins family in Hawkins County in 1830. It is believed that one Benjamin Collins born 1790 - 1800 is the same as the one called Benjamin Collins, Jr. and listed on the 1850 Hancock County, census. His wife was Elizabeth. In 1840, the older Benjamin Collins is missing but the younger one appears in Hawkins County again. Once again James Collins appears in Hawkins County but is then missing from the 1850 census. Also noted on the 1840 census of Hawkins is the Benjamin Brown family. On this census, the enumerator wrote Benjamin Brown & Nancy Collins near the head of house. This appears to be the Nancy Collins, wife of the older Benjamin from the 1830 census of Hawkins. She was most likely the mother-in-law of this Benjamin Brown and living in the home after her husband passed away. The first name of the older Benjamin Collins and his wife were obtained from Melungeons And Other Pioneer Families by Jack H. Goins. Although the above families do not seem to match the criteria to have been Nancy Scalf Collins’ family, it is believed that the Benjamin Collins family is connected in some way due to the following information. An excerpt from “Families of Hawkins County Vol. II, 1786 – 1999” concerning the family of Benjamin Collins is listed below. In the process of elimination, it appears that this family could possibly be related to the family of Nancy Scalf Collins. “Marvel Collins was my third great grandfather. He was born 1825 in Hawkins County, Tennessee, the son of Benjamin Collins, Jr. (circa 1789 – 1890) and Nancy (?) Collins. Benjamin Collins, Jr. was the son of Old Benjamin Collins, Sr. (1760 – 1830), one of the early settlers of Hawkins County, Tennessee along with other early Collins Settlers, namely Vardy and Solomon Collins. These Collins settled the Newmans Ridge area of northern Hancock County, Tennessee in 1844. Old Benjamin Collins Came to Hawkins County probably as early as the 1780’s from the New River Valley area of Virginia, near the North Carolina border (present Grayson County, VA). It is believed Benjamin was the son of John Collins, who died about 1790 Grayson County, Virginia. Elizabeth born circa 1845 married Samuel Payne. Armin, born circa 1847, married John Fields. Lewis born circa 1849, married 1) Nancy. 2) Mary. Martha “Patsy” born circa 1850, married Jesse Bunch? Sarah born circa 1852 married George Collins. Eliza born circa 1855 married Eli Pike. Mary born circa 1867 married Hillery Williams. Drucilla born circa 1859 married Elijah Williams. Thomas born circa 1864 married Luverna. Margaret born circa 1866 married Andrew Collins. John born circa 1866 married Mary. George born circa 1866 (twin of John) married Almeada Collins. A Benjamin and John Collins were found in Jones County, North Carolina in 1800. Benjamin was listed as 45 and over as well as John. It would be difficult to determine by this census if John was Benjamin’s father but Benjamin was born 1755 or before according to this census. There appears to be a John Collens in Wilkes County, North Carolina in 1800; however, he is listed as 26 – 45 years old and would have been born 1755 – 1784. No other Collins family was found in Wilkes County. Either of these men could have had sons that married Nancy Scalf Collins or Nancy could have married one of these men. It was not uncommon for women to be far younger than their husbands during this time. On page, 43 of the book, Melungeons: And Other Pioneer Families, Mr. Goins discusses some trial cases concerning illegal voting of some Melungeon families of Hawkins County who were charged on this account beginning in 1846 and continued through 1848. One of the Collins men charged was Ezekiel Collins whose parents were Benjamin Collins and Nancy ___. As noted above, on the 1840 census of Hawkins County is listed an older Benjamin Collins and a younger Benjamin Collins. By 1850, the older Benjamin Collins is missing but the younger Benjamin Collins is living near Nancy Collins in Hancock County which was created from Hawkins in 1844 and became official around 1846/47. Excerpt from Melungeons And Other Pioneer Families: “According to the history given to Will Allen Dromgoole in 1890 by Calloway Collins, Ezekiel and Andrew Collins in these court cases were the sons of Benjamin Collins. They were known as the Ben Tribe. “Old Benjamin Collins one of the Pioneers was older than Vardy, but came to Tennessee a trifle later.” (Goins, page 43). It has been stated that the Nancy Collins in Hancock County, Tennessee 1850 was Nancy Gibson Collins. However, I have no confirming evidence that this is fact. This is the same Nancy Collins listed in the Scalf Family History as being the daughter of John Scalf, Sr. and again, Elmer Scalf, author of Scalf Family History left us no clue as to how he determined that this Nancy was in fact, Nancy Scalf Collins. We only have the writings of Henry P. Scalf and Elmer D. Scalf to rely on for these earlier families along with a very few meager records. Several factors might suggest that Nancy Collins listed in the 1850 Hancock County census was the daughter of John Scalf, Sr. The first clue is the fact that Dicey Scalf is believed to have married Squire Williams, not John Williams as stated in Scalf Family History. This is presented in the statement of Squire Williams made in support of John Scalf, Sr.’s pension in Hawkins County, Tennessee 1838. Information was related to Abraham McClellan that the folks making these depositions were the son-in-laws of John Scalf, Sr. According to this statement, Dicey Scalf married Squire Williams. Listed nearby the Squire Williams family in Hawkins County in 1840 is Charles Williams, father of Rebecca Williams who married Marvel Collins, son of Benjamin Collins, Jr. who is listed near Nancy Collins in Hancock County 1850. Marvel had a daughter, Milly Collins, who appears to be the same Milly Collins living in the home of Jeremiah Trent and his mother, Polly Trent, in 1860 Union County, Tennessee. It is unknown why Milly was living in their home as her parents were still living at this time, however it does suggest a relationship between the Marvel Collins family and the Polly Scalf Trent family. Polly Scalf Trent married Alexander Trent and was a sister to Nancy Scalf Collins. It appears that either Alexander had died or Polly and Alex had divorced by 1860, as Alex is no longer found as head of house but Polly is found in Union County, Tennessee living in the home of Jeremiah Trent. The age of this Polly would fit Polly Scalf Trent. It is undetermined at this time if the name Jemima listed in Scalf Family History as a daughter of Polly Scalf Trent is actually Jermia and not Jemima. (See chapter on Polly Scalf Trent for more information). Patsy Counts Scalf stated in her deposition in Hawkins County, Tennessee in 1845 that Nancy Collins had 5 children by 1845. Only three are listed on the 1850 census of Hancock County, Tennessee. Elmer Scalf names her children as follows: Alford Collins born 1830, Conaway Collins born 1832, Ritta Collins born 1834 and Harrison Collins born 1836. There should be one more child and this child is believed to have been Manerva Collins who married Jonathan Hurst. Manerva was born around 1833 if her age was listed correctly on the 1860 Whitley County, Kentucky census; however, she could have been born before this, as ages are usually not correct on the censuses. Nancy Collins is found in the home of Jonathan Hurst in the 1860 Whitley County, Kentucky census listed as age, 75 and born 1785. This correlates near the birth date of Nancy Scalf Collins. The head of house was usually responsible for stating the information for the enumerator; however, if the head of house was gone someone else gave the information. Nancy is listed as being born in Virginia and on another census in Tennessee. This is another problem found on the census records. Most often, they did forget over a period of years exactly when and where they were born and often the person supplying the information did not know. Nancy Scalf was born in North Carolina according to the earlier records. This may or may not be Nancy Scalf Collins; however, until further evidence proves this is not Nancy Scalf, we will continue the research into this family. Scalf Family History states, “Nancy went to visit the Jonathan Hurst Family in Whitley County, Kentucky in 1860. Ira Scalf’s son Greenberry had a daughter Mollie who married Brown Hurst in Laurel County, Kentucky in 1886.” (Scalf Family History, pg. 178). Nancy’s daughter, Ritta Collins, was found as head of house in Hancock County, Tennessee in 1870. In her home is Nancy Collins age, 75. Neither Nancy nor Ritta were found as head of house in this area in 1860. According to this information, it appears that Nancy Collins in the home of Jonathan Hurst in 1860 is the same Nancy in the home of Ritta Collins in 1870. 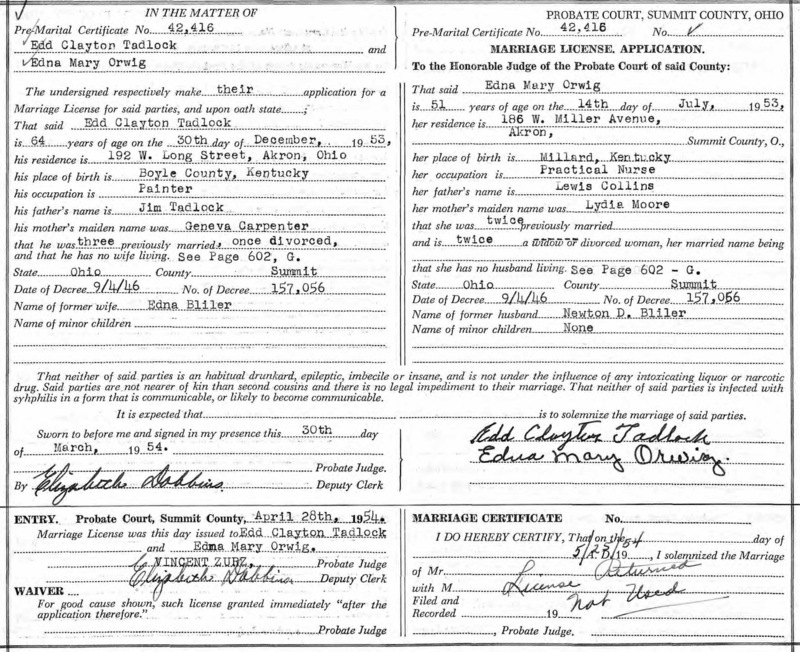 Ritta had married earlier and according to an index to the Chancery Court Records of Hancock County. This index records a divorce between Ritta Collins and her Collins husband in Hancock County. The actual papers have not been found at this time. Apparently, Ritta and her husband had divorced 1860 – 1870 and Nancy moved back to Hancock County, Tennessee where she is living with Ritta. Again, Nancy’s age is listed as 75 but this is also something that happened often on the census records. Nancy would have actually been 82 years old at this time. Neither Nancy nor Ritta were found after this census. It is stated in Scalf Family History, page 178, that Nancy had a son named Alford Collins born about 1830. Alford/Alfred did not appear on the 1850 census with Nancy and was most likely married and in his own home. From the 1860 census of Hawkins County, Tennessee, the Alfred Collins family was found in District 9. NOTE: The 1860 Census above was added for comparison and the similarity in names. However, the Alfred Collins family in 1860 and the Alfred Collins listed below in 1870 may not be the same family. In all likelihood it is the same family as Milly was used for a short name for Permilia. It does appear from these two census records that the child, Martha, listed in 1860 might have died before 1870. Alfred was not found in the Tennessee censuses and is believed to be the same Alfred Collins living in Knox County, Kentucky in 1870. There were a number of Scalf cousins in Knox and Clay counties. By 1880, Alfred is missing but his wife and daughter, Florida A. are found living in Hawkins County, Tennessee in the home of Alfred’s daughter, Nancy J. Collins McPeak. Nancy J. Collins daughter of Alfred and Permilia married William R. McPeak. There were two Conaway Collins in the Hancock/Hawkins/Grainger County areas. I am not familiar with the other one and do not know his age or birth date. The Conaway listed below however, is believed to be the son of Nancy Scalf and her husband. Conaway was not found after the 1880 census. Ellis Collins, the son of Conaway Collins and Elizabeth Williams, was born May 14, 1856 in Tennessee, and died September 11, 1922 in Scott County, Virginia. Ellis married (1) Mary Elizabeth Wiliams (2) Margaret ______. 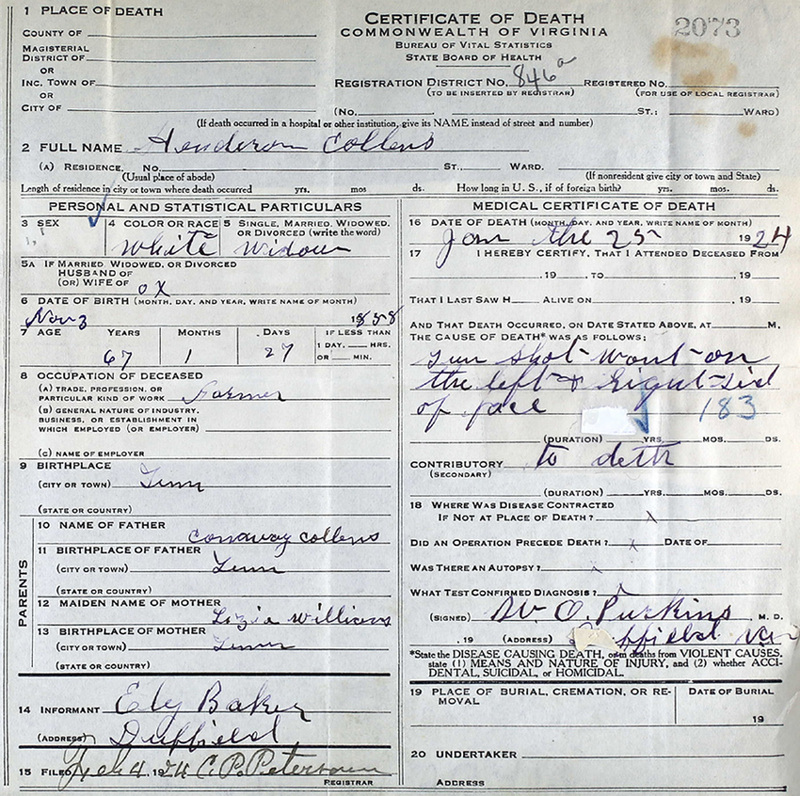 Link to Ellis Collins death certificate. Henderson Collins, the son of Conaway Collins and Elizabeth Ann Williams, was born November 3,1858 and died January 25, 1924. Henderson married Mary Elizabeth Collins. Elizabeth was born July 1857 and died March 20, 1919 in Pattonsville, Virginia . In the 1910 census, the entire family is listed as Mulatto. Lewis Collins, the son of Conaway Collins and Elizabeth Ann Williams, was born about 1872 in Tennessee died November 20, 1939 in Lawrence County, Ohio. Lewis Married Lydia Moore on March 29, 1894 in Lee County, Virginia. Lydia was born about 1868 in Virginia and died March 7, 1943 in Lawrence County, Ohio. Josephine Collins, the daughter of Conaway Collins and Elizabeth Ann Williams, was born about 1865 and died October 29, 1938. Harrison Collins, the son of Nancy Scalf and ______ Collins, was born March 10, 1836 in Hawkins County, Tennessee and died December 25, 1890 in Ozark County, Missouri. Harrison married Sarah Caroline Williams. Sarah was born about 1833 and died March 4, 1915 in Tupelo, Jackson County, Arkansas. Harrison Collins appears to have been the youngest son of Nancy Scalf Collins and her husband. Harrison left descendents of this line a legacy to be proud of. As his grandfather, John Scalf Sr., had done before him, Harrison fought for his beliefs in a war that took the lives of many fathers, brothers, cousins, nephews, and uncles, and very often families were fighting against each other. The East Tennessee area was divided in its loyalty to the Union and the South during the Civil War. This area was known as a “hotbed” and many neighbors were in conflict against each other; therefore, it could not have been easy for the Harrison Collins family living in Hancock County during this time. However, Harrison made a choice to stand for the Union and did so bravely and proudly as can be read in the article listed below. Harrison had many family members who chose to fight for the Confederacy and no doubt, caused much conflict between them. Very little is known of Harrison and his family other than what was found in this article. In an article from the Tennessee History Magazine, Harrison Collins is listed as the only “Melungeon” to ever receive the Medal of Honor and establishes Harrison Collins as “Melungeon.” This Harrison Collins is the only Harrison Collins known to this writer to fit the criteria to have been the son of Nancy Scalf and her unknown Collins husband. Harrison would have been around 24 years old when the war began in 1860 and 29 years old when the war ended in 1865. Corporal Harrison Collins - 1st Tennessee Cavalry Regiment, USA. Age 24: enlisted March 8, 1862 at Sneedville, Tennessee; born Hawkins County; dark compl, blue eyes, lt. hair, farmer; deserted at Cumberland Gap, Tennessee September 16, 1862; Nov 62/Apr 63 - roll call has present; left sick in hospital at Winchester, Tennessee, July 29, 1863; promoted to Corporal on March 1, 1864; transferred to H Company April 15, 1865; captured a rebel flag at Lynville, Tennessee for which Congress awarded him a medal. It should be noted here that Nancy could have been the wife of James Collins. This family had five children in the home in 1830 and three at home in 1840. There were only three listed in the Nancy Collins home in 1850 Hancock County. According to Patsy Counts Scalf, Nancy had five children. If James Collins was the husband of Nancy Scalf Collins, it does appear there was a family connection between James Collins and Benjamin Collins, Jr. This is all the information known at this time concerning Nancy Scalf Collins. It is our hope that someone might have the pieces to this puzzle to finally determine which Collins Nancy Scalf married. Copyright (C) 2004 - 2017 by Margaret Fleenor, All Rights Reserved.